This story contains spoilers for the movie Hereditary. For Milly Shapiro, making one of the most gruesome, disturbing cinematic moments of the year was "fun." As Charlie, the youngest member of the ill-fated Graham family in this summer's indie horror hit Hereditary, Shapiro is an unnerving presence, wielding a masterful dead-eyed glare and making some seriously creepy arts and crafts projects. On the phone, she's a cheerily chatty 15-year-old even when the subject matter happens to be demons and severed heads. Oh, yes, about that. By the end of the film -- once the demon Paimon's will has been done -- heads are rolling like bowling balls, but Charlie's is the first to go. Her mother Annie (Toni Collette) insists that her stoner brother Peter (Alex Wolff) bring her to a party where she sulks and eats a piece of cake that sends her into anaphylactic shock. (It's already been established that Charlie has both a sweet tooth and a very bad nut allergy.) As Peter rushes her to the hospital erratically, she writhes, gasping for air out the window in the backseat of his car. Swerving on the barren road, her head makes contact with a telephone pole. The next we see of it, it's detached from her body, covered in ants. Shapiro -- who, by the way, got her start as a Matilda on Broadway -- talked with Thrillist about her beheading scene, her character's penchant for "clucking," and why she wants to keep her decapitated noggin. Thrillist: What were your first impressions of Charlie when you read the script? 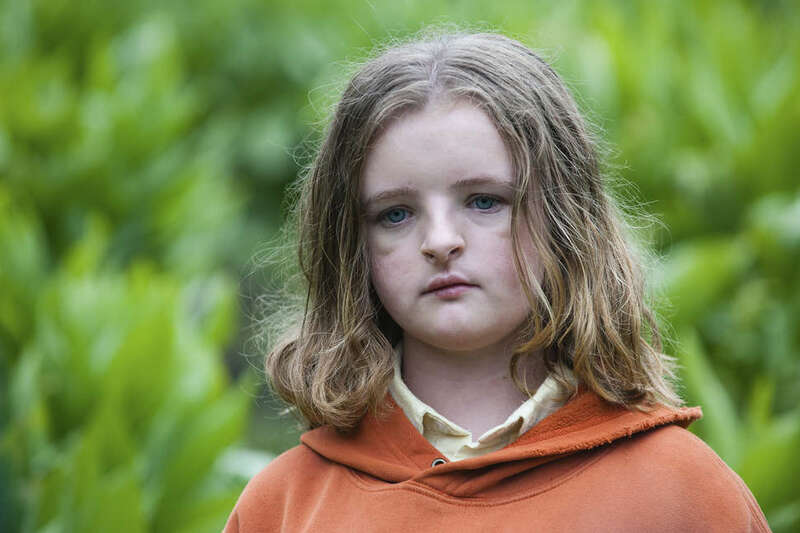 Milly Shapiro: My first impressions of Charlie were that she was very misunderstood and very otherworldly in the sense that she didn't really understand why the world that she was in worked like it did. Her thought process and way of thinking what was right and wrong were very different from everyone else's. She thought everyone else was wrong in a way. Did you and director Ari Aster talk about her from the beginning as being influenced by the spirit of Paimon? Or did you approach her as just a girl? Shapiro: Well in a way, Charlie and Paimon are the same person. It's very confusing when you first watch the film to try and figure that out, but me and Ari really got down into it and figured out was there any of Charlie in the first place, or was it always Paimon? And did Paimon know that they were even there? She's almost like a lost child, she doesn't really understand anything and she is very confused. She's taken care of but not in the way that everyone thinks she [is]. Shapiro: I kind of mean she needs to be taken care of because she doesn't really understand the world around her and she doesn't really know how she should go through things and people are trying to take care of [her], but not in the way that she wants. You have said you envisioned your outer animal as a turtle and her inner animal as a snake. How did you come up with that, and how did that play into these notions of what's Charlie and what's Paimon? Shapiro: Usually I do that for a character. For the outer animal, it's a lot of physicality and their outer personality that they present to people. I thought of a turtle for Charlie because she likes to reclude inside of herself. She has a hard shell that nobody can seem to break open. Then for her inner animal, the snake, I chose because snakes usually have an evil or negative connotation to them but they're not always really bad. They're usually misunderstood and just trying to get through. What were you thinking when you were making Charlie's "clucking" noise? Did Ari give you any explanation as to why she does that? Shapiro: He did, actually. It's kind of like a tic for her. It's something that makes her feel calm when she's nervous or stressed out. She makes the sound to calm her down. We actually did talk a bunch about creating the perfect clicking or clucking sound. It's kind of funny because it seems so simple when you first see it, but a lot of thought and work went into it. Can you tell about what were the "right" clucking sounds and what were the "wrong" clucking sounds? Shapiro: The first thing they did is to figure out the right tone for it because if you think about it, there are a lot of different clicking sound you can make. You can make one like [clucks] that's in the film. Or you can do a [makes a slightly different sound] more like a click. We had to have one that was loud enough, also one that was recognizable enough so you weren't like, "Oh, this is just a door closing in the background." Once we found it, we were like, "This is the right one," and it ended up working so well. What was the experience of shooting Charlie's death scene, both the moment in the car but also at the party? Shapiro: I was actually really nervous for it. Out of everything that I did, I was the most nervous for that. I think the first scene I actually filmed was part of the party scene. So I was really nervous. I met with Ari a few times, though, to work it out and make me less nervous. But yeah, it was just stressful. I really wanted to do a good job and be as accurate as possible and show the emotions of the character changing and their reactions to that sort of situation. I was really nervous, too, because I really wanted to do a good job. It was my first film, and with that, being my first scene made me nervous too. If it was something like, "Oh, you are going to pretend to sleep or walk down a hallway," I would have been like, "OK, this is a good, nice place to jump on the ride." It was like, "OK, so you are going to jump on the hardest part possible and just have fun with it." And I ended up having a lot of fun and it went pretty well. It was just really great. Was the car scene a little bit later? Shapiro: I think it was a little bit later. It's hard to remember the exact order that we filmed in. I remember the party scene being my first and the car was not that far afterward. But I was really nervous. The party scene is really the beginnings of it, and you have to really see how it builds acting-wise. It was very stressful for me. There must be an added level of stress when you're working with the car. What was that like? Shapiro: The first time we actually filmed that scene, we did it on a soundstage and the car wasn't actually moving, which I thought was absolutely hilarious. They had this giant fan for wind. I, on the inside, was laughing very hard because it just seemed very ridiculous. They were moving the car from the outside and I thought it was really funny. I had so much fun with that. Then the next time, we actually did film outside. I was tethered into the car for when I was hanging out. I had my feet dug in the seat cushion and someone holding my hoodie and my tether, making sure I was good and safe. We were driving 30 mph and then randomly they would swerve and not tell me so I would be startled. It was a lot of fun. Shapiro: Yeah, because it was kind of like a rollercoaster in the way that it was really fast and really windy and I love rollercoasters and I love acting so doing both at the same time was really cool. Was it hard to maintain the choking element while you were swerving on this rollercoaster ride? Shapiro: It was a bit challenging, but I didn't have to film anything the next day, so I reminded myself that if I stay really in it right now, I'll get a really good shot because this is a really important part of the film and I need to do the best job that I can. I kept reminding myself that and I just told myself to just go for it. When we did it on the soundstage, I ended up going to a little too hard because I ended up getting a bunch of bruises on my side from hanging out. I just didn't notice because [of] the adrenaline of everything. I was whacking myself against the car and I had no idea either, which was really funny. And then I had, like, scratches on my neck. I always do that to myself whenever I'm doing something. I'll always not notice it. They gave me pads for the next night on my side. It was really funny because I had to shove almost like a pillow in my shirt so I wouldn't get more bruises. Was there a disconnect when you finally saw it on screen and it's such a scary, horrifying moment? Shapiro: I was really nervous the first time I saw it because I wanted to see everyone's reactions. Whenever I do see that part, the music, for some reason, in this film gives me such bad anxiety. I'll be listening to it and I'll just get anxious and I feel my heartbeat race and I was like, "I was there, I did this." It just makes me so nervous for some reason. You used a stunt double for the actual moment of impact? Shapiro: Yeah. I wasn't actually near any poles. It was just on an open road with nothing [near]by. What was it like seeing a model of your decapitated head covered with ants? Shapiro: It was really cool. I did do a mold for it and I was really excited to see how it would turn out because I had never had anything done like that before. So getting to see my face was so strange and so cool at the same time. I really want my head so badly, to have it and to display it and scare people with it. But yeah, it was so cool. Have you talked to Ari about this? Shapiro: I've sneakily mentioned it a few times. Like, "Oh, if you're not doing anything with it, I'll just keep it in a fruit bowl. It will be really fun." I really want it though. Halloween's my favorite holiday and there are so many cool things I could do with it. What do you think of the "creepy kid" archetype that a number of people have lumped Charlie into? Was that something you had in your mind? Was it something you were trying to avoid? Shapiro: I think it's interesting that people are putting her in the creepy kid genre and it makes a lot of sense that they are categorizing her like that. But I think the reason that people categorize her with the creepy kids is because she does do things that are strange and that they don't really understand and that they usually see morally as wrong. It's very interesting that the kids that are categorized in the "creepy kid" genre usually, to me, they're not really that creepy, per se, they are more just misunderstood and in a bad circumstance. Usually the thing that makes them so creepy is kids are seen as innocent, so when they do things the average person doesn't think is morally right, it makes them creepy, because it makes you feel like something's wrong. But to them, usually, they're not trying to be creepy, which is something I don't think a lot of people really think about. Because to them they're just being themselves. Kids are always the most true to their personality, so it's really interesting because to them, they're not a creepy kid -- they are just a kid. Did you get to play around with Charlie's creations? Did you get to help put them together at all? Shapiro: I fake-helped put them together. I try to be really artsy but I'm really bad at any arts and crafts. They would give me pieces and be like, "Pretend you are twisting this," or, "Pretend you are putting these two things together." I would be like, "OK." Then I would bang them together repeatedly. Like, this is how it works. It was very funny.